Science has proven that both sexes are attracted to facial symmetry. Good looks are an indicator of health. Therefore from an evolutionary standpoint being attracted to beauty makes sense. But what counts in real life? Are we slaves to our superficial instincts or do we value personal qualities equally or even more? The ugly truth is that you could be the most reliable and good hearted guy – if she doesn’t like your looks she will reject you before she gets to know you. A gorgeous man on the other hand, even if he’s the devil himself, will get his chance to meet her. Sad but true – good looks can fool anyone! But does that mean a man has to be extraordinarily attractive to be with high-quality women? What if I don’t look like Ryan Gosling? Yes, every woman is attracted to handsome men. (at least until she talks to them) But that doesn’t mean an average looking guy can’t become equally or even more successful with women! However, there are a few leaks every man must plug before he can win a lady’s heart. Eliminate these no-go´s to become a naturally decent looking guy. It’s to your own advantage: By improving your exterior you will see yourself as a more attractive man when you look in the mirror and as a consequence your confidence will rise. Easy change, major improvement. However you don’t need to change your whole wardrobe and get six-pack abs! A well groomed, trained man in a simple and casual look (jeans and t-shirt or shirt) is naturally attractive to women. As always don’t overdo it, let her be the stylish one in the relationship. Find your own individual style that suits to you. Naturally attractiveness has a lot to do with Self-Improvement. Even George Clooney wasn’t born “Sexiest Man Alive”. Nicolas Cole is a fantastic example for a man who decided to reinvent himself. At the age of seventeen he was one of the highest ranked World of Warcraft players in North America. At the time he didn’t have any real friends and felt lonely and depressed. When he was nineteen he ended up attending a drug rehab. It was there when he realized that nothing was going to change unless he did. When I discovered Nicoles on Quora, I was impressed by how he transformed his look. You don’t need to get a super athletic body like he’s got. 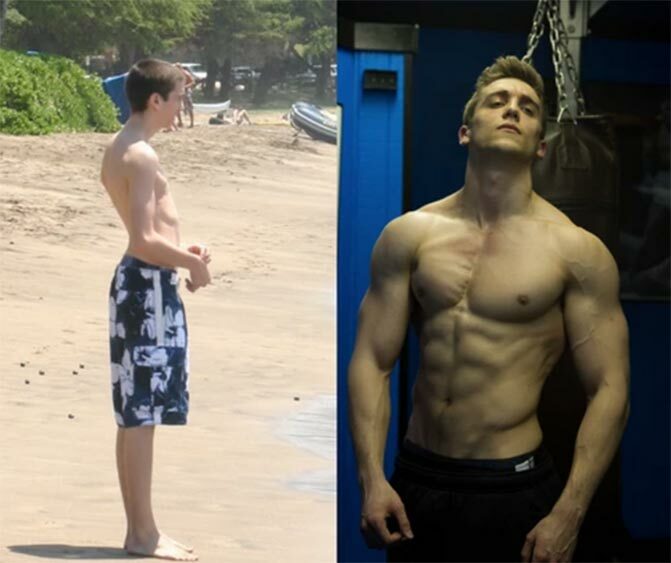 Nicolas chose bodybuilding as his way of transforming himself. Yours could be totally different. What matters is finding something you enjoy that motivates you, gives you passion and keeps you away from negative habits. Self development is a road filled with questions, always giving you two options—the easy road and the hard road. The people that take the easy road, they talk a lot about where they want to go, but they are rarely present, not realising that right now, in this moment, is actually the opportunity to move one step closer to that ideal self held in the future. The hard road is that constant decision of being in the moment, facing the challenge, and always remaining present. Superficial qualities attract superficial people. If you want to sleep with easy women you picked up at a noisy nightclub then I strongly recommend improving your looks as much as possible. But if you want to be with someone special who you don’t want to leave the next morning, a different set of qualities is required. High social status, confidence and authenticity are just three of many qualities that trump looks every time you want to meet someone outside of a dark and noisy club. Find something that’s beneficial to your life and immerse yourself in it. Know that other qualities such as confidence, charisma, high social status and intelligence are much more attractive than looks.